For seasoned marketers and newbies alike, building and maintaining a steady following on Twitter is often one of the most time-consuming and daunting tasks a person will face when expanding their web presence. Unfortunately, no matter how frequently you post, your Twitter following just won’t grow to the astronomical amounts that you’re seeking. Most importantly, without a great following, your posts won’t be heard and you will find yourself wasting valuable time. The most effective method to achieve huge growth is to proactively build your audience. You can’t just wait for Twitter followers to come to you. You need to actively go out there and find them. Fortunately, there are a few tricks you can use to guarantee substantial growth and to find followers that actually want to hear what you have to say. And the best part? It can be done in as little as 30 minutes a day. So what does it mean to actively build your audience? Look at it this way: are you building your audience by letting followers come to you, or are you actively engaging them? As an active brand, you need to immerse yourself in whichever niche you belong and insert yourself into conversations. Throughout the article, we’re going to be examining examples from different marketing brands to show you real life practical ways to start using these steps! Let’s get started. When you engage with someone on Twitter, they’re likely to view your profile first and see what you’re all about. To up the odds of getting those clicks, be sure to have a completed bio that explains your purpose and profile picture that can be easily identified on any platform. Your bio is the first thing that people are going to read once they arrive to your account. That’s why it’s super important to make it sure it’s complete and gets your message across. Include a brief, informative, friendly description of your company of your proposal. Consider using keywords or a hashtag as well. You definitely want to include your company website as this will help you increase your CTR on Twitter. 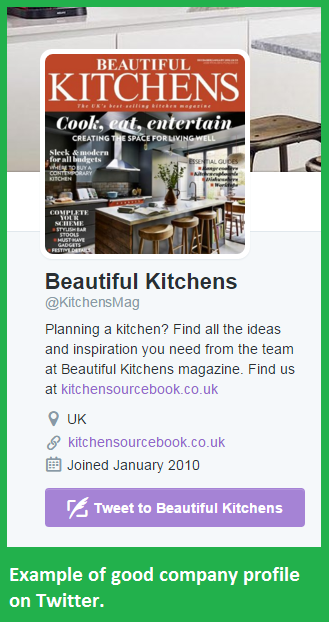 Take a look at the Beautiful Kitchens’ Twitter Bio below. If you like, you can use a picture of yourself (smile!) but just make sure it’s relevant to your niche. And even though you might have a cool looking logo, unless it’s globally recognized, skip it and use a more memorable, fun, and enticing image that shows the audience what exactly your company offers (for example, show us your products or services). The important thing is that we know exactly what you’re all about as soon as we get to your profile. 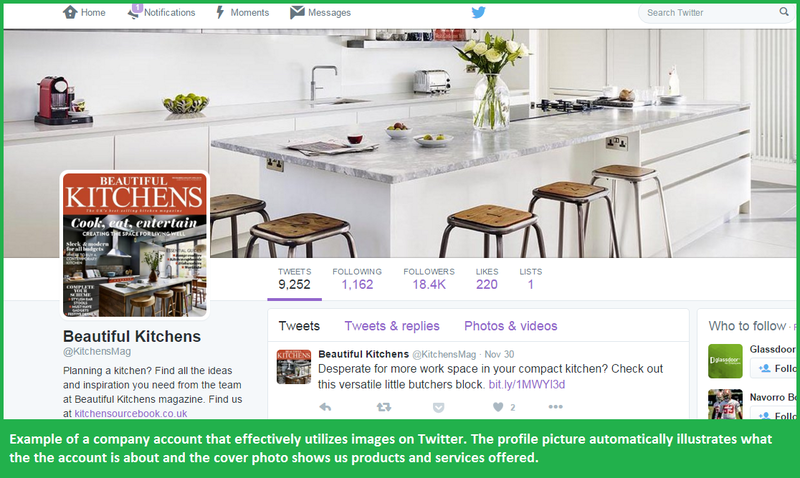 Like in the example above of Beautiful Kitchens, we see kitchen products in the cover image and a shot of their magazine as their profile picture. Right away, we know what the company’s proposal is and what they are offering. Another example is great example is NewCastle Brown Ale. Check out their use of the #NoBollocks hashtag as well. Next, make sure your Twitter name is relevant to your store. If your brand name doesn’t automatically give away what niche you are in, consider including a reference to it in your name. For example, instead of your Twitter name just saying Snap!, it should be Snap! Cameras & Accessories. Finally, consider using an attractive pinned Tweet that lets visitors know more about you. This could be something that describes your business’s personality, or maybe a redirect to your website. 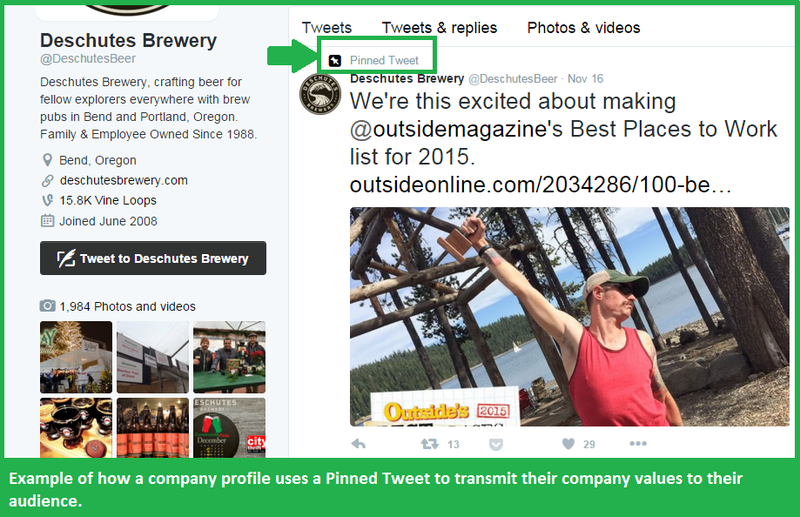 Check out Deschutes Brewery: They pinned a tweet to the top of their profile that also transmits one of their values as a company, which is a fun and active environment to work in. Check out this article on how to use GIF’s effectively to reach your audience and to find out how to create your own! This is the most important step. Again, say you have a camera store. 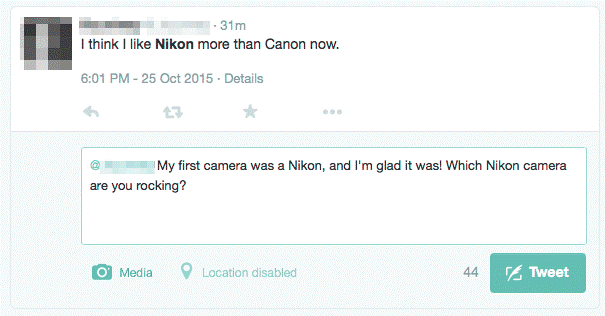 You need to actively seek out Twitter followers that express an interest in cameras. Maybe they are asking for technical advice, or maybe they are looking to upgrade their camera and can’t decide which one to buy. Chime in on the conversation. Offer something valuable. Find a way to engage them and then let them come to you. Don’t try to sell them anything. Don’t advertise your website. And don’t ask for a follow. It may seem counter-intuitive, but the purpose here is to build your following and reputation. The trick is that you need to do it in a subtle way that adds value to the conversation without trying to spam them. This way, you spark their interest and let them come to you. If you’ve created a clear and attractive bio, this should be no problem. For this part, I’m going to introduce a few Twitter search tips that you’ll find invaluable. They’re called operators, and they’re going to help you filter out the noise and find the results you’re looking for. Head over to search.twitter.com to get started. This allows you to get rid of all of the Tweets with links. Often times, when someone shares a link, they’re promoting their own product or website. What you’re left with are Tweets from real users having real conversations, which is exactly what you’re searching for. This allows you to search for specific phrases or spellings, and yields more accurate results. This is a cool one. Simply adding a question mark to the end of your search will show only Tweets that are phrased as questions. This is a great way to provide helpful input to questions that will likely result in sales. Shows only posts that are directed to a certain person or company. Shows users that are located near a certain area. For example, NYC for New York City, or LA for Los Angeles. Get creative and combine operators. For example, if you search to:nikonusa ? near:SEA you will yield questions asked to the official Nikon page by people living in Seattle, Washington. This can be a valuable tool if you have a physical store that people can stop by. 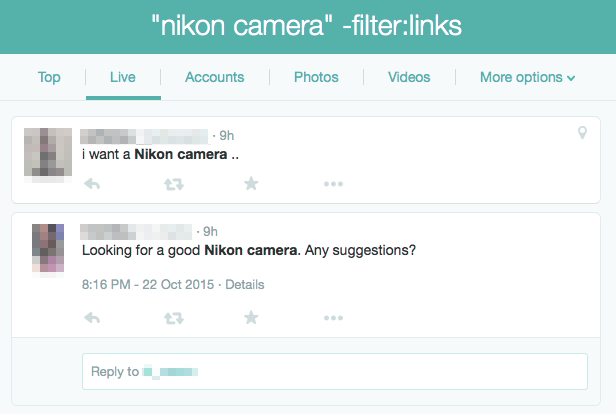 As you can see, this will yield users who are interested in a Nikon camera and who aren’t sharing links. From here, just talk to them and lend your advice. If you don’t have anything to contribute to the conversation, just favorite their Tweet and they’ll notice you. This is the final step to becoming an active Twitter brand. Now that you know how to search more effectively, you’ll want to follow other people within your niche. For our photography example, following and engaging with world-famous photographers or even just enthusiasts is a good way to get your name out to potential followers and customers. Find out who your competitors are and head over to their Twitter page. 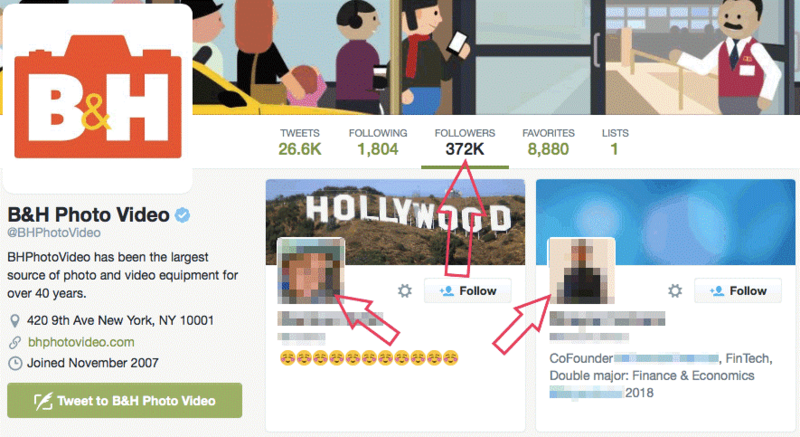 From here, you can set a goal of how many followers you want and of how many people you want to be following. If you try to follow around 40 people per day, this step can be done in as little as five minutes, and if you have a smartphone, it can be done from anywhere. We recommend that you don’t exceed 40 new users per day, that way Twitter won’t think you’re spam! Don’t forget to Maintain Your Follower Ratio! Finally, keep your follower-following ratio in check. As you already know, following someone else is a good way to get a follow-back, but if you don’t get one within a few days, don’t bother with them. After you get rolling, you’ll want to unfollow people that haven’t followed you back in order to keep a good-looking ratio. Again, aim for people that are already popular within your niche and your numbers should grow very quickly. Once you get big enough, people will begin to actively seek you out. Once a week, head over to TweepDash and sign in using your business’s Twitter account. Here you can instantly find out who’s following you and who’s just damaging your ratio. Sometimes you’ll want to be selective. If you follow people (not businesses!) that are already influential, it could be a great lead to other potential followers. Be careful with the amount of people you unfollow. Too many at a time and Twitter will think you’re a spammer. Aim for just 20 unfollows a day if necessary and you should fly under the radar while building your following. Now that you’ve updated your bio, photos, pinned an awesome tweet to the top of your page, know how seek out potential followers, and interact with them your final goal is to KEEP them….and you KEEP them by sharing relevant content. This is something you should already be doing. No one is going to want to follow you if you can’t provide interesting and quality content. This comes back to providing value. Remember to do some research on your audience and find out when the best times to share your awesome content are. Once you find out I suggest you add Postcron for Chrome, one of the extensions for Social Media you’ll find most useful. With its help you can schedule tweets while surfing the web, to automatically publish at the times you indicate. That way you save time and you make sure that your new followers always find your content interesting and stay by your side! Remember that Twitter Cards help your content stand out and be more attractive to your Followers. To find out how to use them check out our article How to Take Advantage of Twitter Cards. Set realistic goals and then take the steps needed to achieve them and you’ll reach rock star Twitter status in no time. 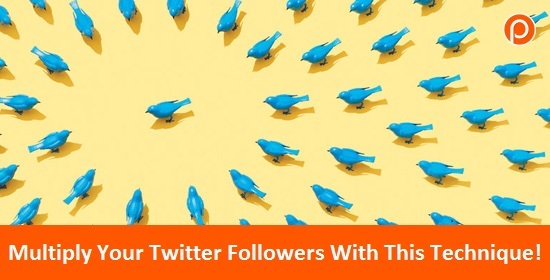 The 4 steps we’ve shared with you today are a sure way to grow your Twitter followers. The best part about it is, once you have your profile updates, the rest can be accomplished on daily basis in about 30 minutes. Don’t believe me, try it out! For more Twitter info, check out our articles Just the Tips! How to manage your Twitter account more effectively or if you’re new to Twitter: Top 10 Twitter Tips for Beginners. Did you find this article useful? Do you have any other ways you use to gain more followers on Twitter? What did you think about the operators to make searching easier? Tell us about your Twitter Experience!